The definitive Accredited Level 2 Food Hygiene Course following the latest EHO Approved Syllabus. A flexible online video-based course filmed on-location and completely updated for 2017. Fully accredited by QUALIFI, an OFQUAL regulated UK Awarding Organisation, this course covers all the most common food hygiene threats in a catering environment. It also provides a strong Due diligence defence in the event of a serious food hygiene failure. Over 250,000 copies sold in UK. Which level of training is relevant for me? It really depends on what role you have in the food industry. We have created a quick guide and if you need any more clarification, please just call or send an email and one of the team will help you. Our course is designed for “front of house” staff, waiters, concession stands, NHS clinical staff, and retail shop workers who handle pre-packed foods. You will probably be serving food already cooked in a kitchen, you may occasionally have to re-heat food and you will almost certainly be involved in food safety, cleaning, rubbish disposal etc. You will NOT be involved in the preparation or cooking of food from raw. 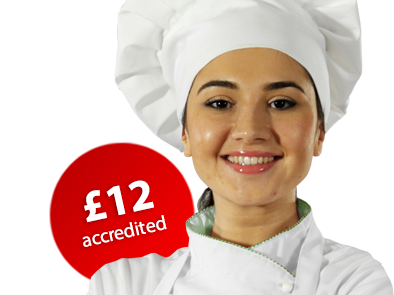 Our course is very much a “mini Level 2” and provides you all the information you need to serve safe food. This is very much seen as the industry standard and is for anyone who handles, prepares, cooks and serves food. It is designed for people who actually cook or handle food from chilled, frozen or fresh/raw. It covers all aspects of food safety including bacteria, physical & chemical contamination, personal hygiene, cleaning, pest & waste control, the law. If in doubt, Level 2 is the course we would strongly recommend as the minimum requirement for anybody working in the food industry. Also known as Food Hygiene Intermediate Course or Food Hygiene Supervisor training. You may be a Head Chef, Supervisor, Manager or Business Owner and you are looking to develop your food safety and management knowledge? Alternatively, you may already hold a Level 2 certificate and are looking to progress both your knowledge and career. The course covers food safety and bacteria in more detail and provides information on how you manage both the business and your team in vital areas such as the law, controlling bacteria and food threats, physical & chemical contamination, cleaning, pest & waste control, personal hygiene and food safety. It explains the importance of a Food Safety Management System inc. HACCP and how you would implement and manage this within the business. Our course also includes two new and unique chapters which cover: Training Your Team, and also Ethics and the Environment. This course is strongly recommended for anyone in a management position. Do I need training to work with food? Will an EHO accept my Level 2 food hygiene certificate? This depends on which sector you work in: catering, retail, childcare or manufacturing. If you are working for a small manufacturer which does not use these processes, then EHO guidance is to choose the Catering version. We would always recommend anyone woring with children undertakes this version of the course rather than the catering version as both are fine but the childcare version covers specific needs of early years and young poeples specific food safety needs. Is Level 2 a Basic Food Hygiene certificate? It was re-named Food Safety for Catering/Retail/Manufacturing when certain food practices and regulations changed. If you have an old Basic Food Hygiene Certificate and are looking to update your training and certification, you'll find it is the same Level 2 course. If you already have a Basic Food Hygiene Certificate then it may be a good time to renew your training. It is recommended that you should renew your training every three years. Is the Level 2 food hygiene certificate instant? Why should I buy your Level 2 food hygiene course? Our takeaway branches only use this web site now as its a lot cheaper than council courses also more easy allow your staff to do it there own time and comfort. Being able to mock test is excellent with option to watch videos for the people that don't want to read. This course was comprehensive, easy to follow and good value for money. Completed the course and gained my certificate easily as did my staff. The course was really good, the videos are very good and the deliberate mistakes are a good idea to make people think! Customer service is also fantastic, I had an issue that was resolved immediately and extremely well. Excellent. It was very relevant and easy to understand .The layout was logical and I really liked how it made a big deal of the exam. Reminding you about the exam throughout and asking you to watch for deliberate mistakes made sure you paid attention. The hosts were real enough to not get boring and yet professional enough to make you take note of important aspects of the training. I was really happy with the course. It was very informative and really allowed me to expand my knowledge. There were diagrams and images that even would assist someone who is alien to the catering industry. It is very clear and highlights the legal framework around the subject area. It also shows appropriate and inappropriate practices. This clarifies previous misconceptions that laymen like myself had. I was overall extremely satisfied and would most certainly recommend the course for people from all walks of life. Last year I put 10 employees through the course and have just signed up another 6. Its a very easy to use course informative and comprehensive. The employees can work at their own pace and there is a fast track option for more experiences members of staff who have done the course several times before.